Fr. Timothy P. Kesicki, S.J., to Head U.S. Office for Society of Jesus, Largest Order of Priests and Brothers in Roman Catholic Church. Headquartered in Washington, D.C., the Jesuit Conference is the liaison office that coordinates the national work of the Society of Jesus, the largest order of priests and brothers in the Roman Catholic Church. The Society of Jesus in the United States announces that Father Timothy P. Kesicki, S.J., has been named the next president of the Jesuit Conference. Fr. Kesicki, who was appointed by Father Adolfo Nicolás, S.J., Superior General of the Society of Jesus, will assume his new position August 1, 2014. Headquartered in Washington, D.C., the Jesuit Conference is the liaison office that coordinates the national work of the Society of Jesus, the largest order of priests and brothers in the Roman Catholic Church. Fr. Kesicki first met the Jesuits when he was an undergraduate at John Carroll University in Ohio, where he studied political science. 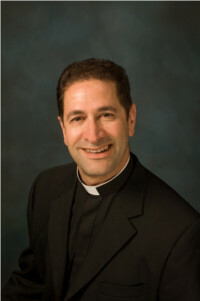 During his Jesuit formation he studied at Loyola University Chicago and the Jesuit School of Theology of Santa Clara University in Berkeley, Ca. After being ordained in 1994, his first mission was with Jesuit Refugee Service in Adjumani, Uganda. Most of his apostolic work has been in secondary education, including teaching theology at Loyola High School in Detroit (1988–1991) and serving as president of Saint Ignatius High School in Cleveland (2000–2008). In 2008, he was appointed provincial of the Detroit Province and a year later provincial of the Chicago Province; the two provinces came together under his leadership in 2010. A native of Erie, Pa., he enjoys skiing, cycling, and playing the piano. Founded in 1540 by Saint Ignatius Loyola, the Society of Jesus (Jesuits) is the largest order of priests and brothers in the Roman Catholic Church. Jesuit priests and brothers are involved in educational, pastoral and spiritual ministries on six continents and in 127 nations, practicing a faith that promotes justice. For nearly 500 years, Jesuit education has made its mark on the world. In the United States, there are 28 Jesuit colleges and universities, 59 Jesuit high schools and 16 middle schools with a shared goal of developing competent, compassionate and committed leaders in the service of the Church and society. Jesuits minister in parishes and at retreat houses and serve as chaplains at prisons, hospitals, nursing homes and in the military. For more information on the Society of Jesus, visit http://www.jesuit.org.